As the unofficial start of summer begins, many of us may be taking to the roads with our pets. Several considerations we need to think of before pulling out of the driveway include safety, comfort, and preparation. With safety in mind, when traveling by car, be sure your pet is secure, either in a carrier or wearing a harness. Pets wandering freely in a vehicle can pose a distraction and are more likely to be injured in the event of an accident or sudden stop. According to the American Automobile Association, about 30,000 accidents are caused each year by an unrestrained dog in the front seat. As much as your dog might enjoy sticking his head out the window, this presents another safety risk and should be avoided. As for comfort, at no point should a pet be left unattended in a car. Even with the windows cracked, the temperature inside a car increases drastically within a short period of time. Pit stops for the pets are necessary as well. Stop every 2 to 3 hours to let your dog stretch his legs and relieve himself. Cats should also have access to a litter box during the commute. Once you arrive at your destination, give your pet a tour so they know where the food, water, and bedding are. In addition, cats should be shown the litter box location. It’s also a good idea to cover any furniture that you think your pet might hop up on. An old sheet or towel will suffice. Below is a reprint of useful travel information, as well as a checklist provided by the American Veterinary Medical Association. Make sure your pet is comfortable with travel. 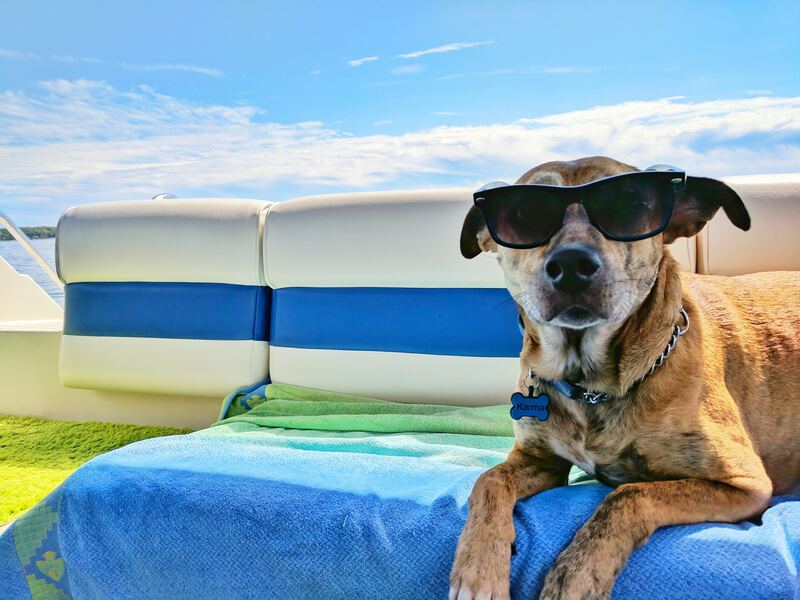 If your pet is not good with travel, you should consider a reliable pet-sitter, or talk to your veterinarian about boarding facilities in your area. Having your pet implanted with a microchip can improve your chances of getting your pet back if it becomes lost. The microchip must be registered with your current contact information, including a cell phone number. A tag is included that has the microchip number and a mobile contact information of the owner, so if the pet is found, anyone can use the tag to determine ownership without having to contact a veterinarian. Contact the microchip company for a replacement tag if you’ve lost yours, and for information on how to update your personal information when traveling. Make sure that your pet is allowed where you are staying. Some accommodations will allow pets and some will not, so check in advance. Also, when traveling, you should bring a portable kennel with you if your pet must be left unattended. When staying with Friends or Family, inform your host that your pet will be coming along and make sure that your pet is a welcomed guest as well. Before staying in a Hotel or Motel, make sure it is a pet friendly establishment. Some hotels and motels only accept small pets or pets under a certain weight. When making a reservation, make sure you inquire about the terms of their pet policy. Try to minimize the amount of time your pet will be alone in the room. When leaving your pet unattended, inform the front desk that your pet is being left alone in the room and place a “Do Not Disturb” sign on the door. Make sure the hotel/motel knows how they can contact you if there are any problems. If you will be staying at a Park, Campground or Marina, make sure these places are pet friendly. Remember to clean up after your pet and always keep your pet on a leash. 5. ID tag should include: Owner’s name, current home address and home phone number. 7. The microchip registration should be updated with your current contact information including a cell phone number. Current copies of your pet’s medical records which include information on pre-existing conditions and medications (especially when re-locating or traveling out of the country). For travel within the United States, a brief summary of medical conditions would be sufficient. Certificate of Veterinary Inspection (health certificate) if needed. Proof of vaccinations (Proof of rabies vaccination required) and other illnesses. Requires an examination by a licensed and accredited veterinarian to make sure the animal is not showing signs of disease. Acclimation certificate for air travel. This is only required by some airlines, so check to see if your airline requires this. If you don’t have our App VitusVet now is the time to download and ensure you are connected. With this app in place you’ll have your pet’s medical records at your fingertips if during your travel they should be needed.